Sound money advocates are often hit with the charge of being “doom and gloomers.” Yes, we do warn that unsound monetary policies enable unsustainable fiscal commitments, which will lead eventually to a currency crisis. Sound money advocates are also often portrayed as party poopers. Yes, we do seek to take away the bottomless punch bowl of easy money and replace it with something more solid. However, we are not pessimists or killjoys by nature. To the contrary, we are quite optimistic about the ability of genuinely free markets to generate ever greater levels of prosperity for ever greater numbers of people. To advocate hard money, as in a gold and/or silver standard, is simply to be a hard-nosed realist about the dangers of giving governments the power to issue unbacked fiat currencies. The case for hard money is based on the proposition that real wealth is generated by productive activity in the real economy. When governments and central banks assume the power to set interest rates artificially low, to expand the supply of money and credit at will, and to bail out “too big to fail” financial institutions, they are engaging in massive wealth transfers. They are stealing purchasing power away from productive workers in the real economy and transferring it to bankers and bureaucrats. Since the U.S. completely abandoned the gold standard in 1971, trade deficits have exploded, government spending has grown out of control, and the national debt has skyrocketed. Even more troubling than the size of the debt officially on the books ($19.2 trillion and counting) is the much larger problem of total unfunded commitments, which some estimates put at more than $200 trillion. Politicians have written Social Security and Medicare IOUs to today’s voters that future generations will be responsible for making good on. 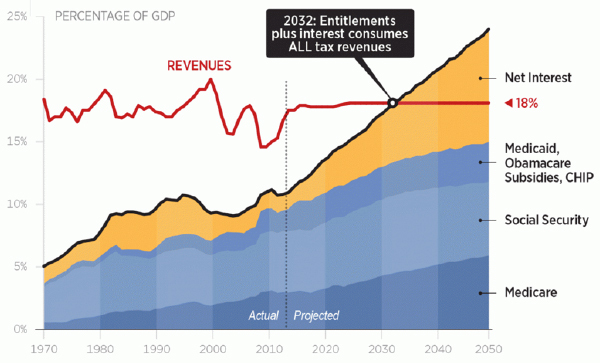 The problem is that promised future entitlement spending, plus interest on the existing debt, will outstrip all projected tax revenues. Politicians have leveraged the fiat monetary system to make spending commitments that would be unthinkable and impossible under a gold standard. As a consequence, a financial crisis of much greater magnitude than we saw in 2008 looms in the not too distant future. Some in Washington talk of entitlement reform, but they have no sense of urgency about it. After all, the government can always borrow more money into existence. It can always find a willing buyer for new bonds at the Federal Reserve. The government may never have to default on its unpayable debts or cut benefits that it can’t afford to pay. Through the magic of unlmited money creation, it can sustain the unsustainable. But not without cost. The costs of inflating the currency supply in order to enable runaway government spending growth will be borne by people in the productive real economy. Businesses and wage earners will see their purchasing power transferred away from them through a combination of taxation and insidious currency debasement. Back in 1983, Alan Greenspan headed up a National Commission on Social Security Reform. Greenspan convinced Congress to raise taxes and gradually increase the retirement age in order to “save” Social Security. The program ran surpluses for a few years thereafter. In the big picture, though, he must have known that all they were doing was kicking the can down the road. Benefits means testing and other measures that might actually put the program on a long-term sustainable fiscal path were deemed politically unacceptable. Ever the political pragmatist, Greenspan, throughout his tenure as Fed chief, enabled the expansion of debt spending with easy money policies. Greenspan’s loose money also helped blow up bubbles in the stock and housing markets. The bubble now building in unfunded government liabilities dwarfs any previous bubble. Unfortunately, there is nothing to suggest that a fiscal turnaround is in the cards. The latest report from the Congressional Budget Office (CBO) shows the federal budget deficit will rise steadily in the years ahead, starting this year with a $534 billion projected deficit. 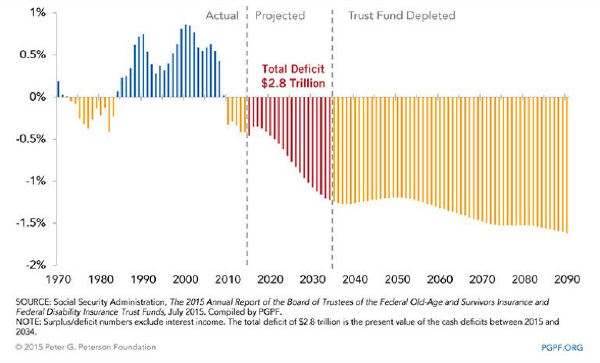 By 2022, the annual deficit will exceed $1 trillion and get even worse in the succeeding years. These aren’t even the pessimistic scenarios. The actual numbers could end up being worse than CBO projections, especially if a severe or protracted recession hits. In the years ahead, the Federal Reserve will undertake the gargantuan task of keeping the system going despite its insolvency – in other words, bailing out the government itself. What will finally stop the madness? A new monetary system based on sound money principles.